Parution le 1er octobre prochain de cet ouvrage intitulé « Rois et princes en 1914 » par Philippe Delorme. En voici le descriptif : « A la veille de la première guerre mondiale, l’Europe ne compte que quatre républiques, dont la France. Partout ailleurs, ce sont des monarchies, dont beaucoup sont aujourd’hui déchues, qui se partagent le pouvoir. Cinq souverains dominent le Vieux Continent : George V, roi du Royaume-Uni et empereur des Indes, Nicolas II, tsar de Russie, Guillaume II, roi de Prusse et empereur allemand, François-Joseph Ier, empereur d’Autriche et roi apostolique de Hongrie, et enfin Mehmed V Rechad, empereur ottoman et calife de l’islam. « Rois et princes en 1914″, Philippe Delorme, Editions A. Sutton, 2014. Published on October 1 of this book entitled « Rois et princes en 1914 » by Philippe Delorme. Here is the description : « On the eve of the First World War, Europe has only four republics, including France. Elsewhere, they are monarchies, many of whom are fallen, who share power. Five sovereign dominate the Continent : George V, King of the United Kingdom and Emperor of India, Nicolas II, Tsar of Russia, Wilhelm II, King of Prussia and German emperor, Franz Joseph I, Emperor of Austria and Apostolic King of Hungary and finally Mehmed Reshad V, Ottoman Emperor and Caliph of Islam. Almost all are related. They form the great family of the « Gotha » as the name of the famous almanac that lists every year, princes and other rulers. However, the imperatives of politics and diplomacy have driven a deep wedge between each other. A few months after the beginning of 1914, they will tear each other apart in a terrible conflict. 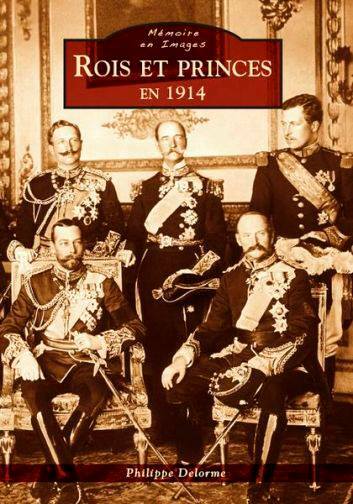 « Rois et princes en 1914 » Philippe Delorme, A. Sutton Publishing, 2014.